A newly identified insect has the coloring of an exotic tropical bird, the defense mechanism of a skunk, and the look of tree debris. Researchers collected the otherworldly stick insect a few years ago from a remote mountain on the Philippine island of Mindoro, and found that it is so unique that it deserves its own genus. The twiggy creature, Conlephasma enigma, has a dazzling blue-green head and fiery orange and yellow body. When provoked, it releases a foul smelling spray from glands on its head. Also unique, the new stick insect “is wingless, with a stout body and rather short legs,” which may be an adaptation to the short vegetation of the mountainous rainforest it calls home, Gottardo told the BBC. He and colleagues reported their findings published online last month (August 22) in the journal Comptes Rendus Biologies. 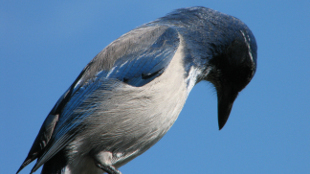 When a western scrub jay dies, its fellow birds gather around for a cacophonous ceremony. But their deafening display isn’t an emotional tribute to the fallen; it’s a sign of alarm, according to a team of animal behavior scientists at the University of California, Davis. The very sight of the dead is enough to “induce alarm-calling and subsequent risk-reducing behavioral modification in western scrub-jays,” lead author Teresa Iglesias wrote in an article published online last month (August 27) in Animal Behaviour. Like all animals, the brilliant blue birds face risks, which they mitigate by spotting signs of danger, she wrote in the article. Without sleuth work to discover the cause of death, a corpse indicates a potential hazard. When the research team presented the birds with a fake predator—a stuffed great horned owl—the western scrub jays created a similar commotion. Regardless of whether the ruckus is from a death or a predator sighting, jays will avoid the hazardous site for at least 24 hours afterward. 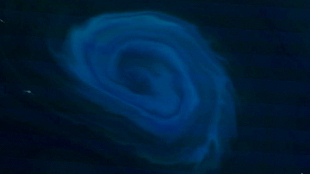 In the dark abyss of the seafloor, some crustaceans can see dim flashes of blue and ultraviolet (UV) light, which may help them discern what’s food and what’s not. A team of deep-sea diving researchers, led by Duke University’s Sönke Johnsen, sunk down to the seabed around the Bahamas, where they found themselves surrounded by small bursts of light, spilling out of bioluminescent plankton colliding with corals and rocks. Though bioluminescence is common higher in the water column, the researchers found the ability in only 20 percent of the species they encountered in the ocean’s depths. Using the robotic arms of the submersible vehicle, they collected a variety of glowing creatures, and measured their light spectra, which ranged from the blue-green spectra (plankton) to the green spectra (corals).They also gathered up and tested crustaceans, and found that they some could perceive blue and UV lights, which may help them identify their food, Johnsen said. “Color vision works by having 2 channels,” Johnsen said in a press release. By combining input from the blue light photoreceptors and the UV light photoreceptors, crustaceans might be able to discern different colors within the blue-green spectrum, helping them pin-point plankton prey among inedible coral, he explained. The research will appear in two articles in the October 1 issue of The Journal of Experimental Biology. "The idea that they may be using it to color-code their food is exciting, but of course still in the hypothesis stage," Johnsen told BBC News. 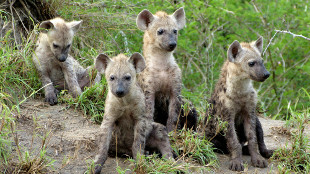 Whether a fellow hyena is friend or foe may depend on the types of microbes they carry, according to an article published August 30 in Scientific Reports. Michigan State University researchers identified bacterial symbionts housed in the hyenas’ scent pouch, located in their rumps, and found that each social group had a unique community of bacteria that produced their signature smell. “The complex social lives of these animals may ultimately be reliant upon their unheralded symbiotic microbial communities,” lead author Kevin Theis, a postdoctoral researcher at Michigan State, said in a university press release. In addition to being a sour-smelling calling card, the odors may help social groups stake their claim on turf. “Multiple members of the clan could more efficiently carry out the job and mark more territory,” Theis said in the release, which could also help reduce clashes between neighboring groups. Following last year’s discovery that a fly parasite can turn healthy bees into tail-spinning zombie bees, researchers at San Francisco State University (SFSU) are out to track infected flies and determine their effects on the rest of the hive. They’ve attached tiny radio trackers—the size of a piece of glitter—to the thorax of infected bees and will monitor the insects’ behaviors to understand the effects of the parasite. The researchers are also monitoring artificial hive entrances and exits, using a dual laser reader. 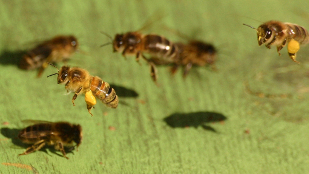 The work will help determine “if parasitized foragers are the recipients of aggression by other workers, for example if they're expelled from the hive, or if parasitized foragers behave in ways that disrupt hive productivity," said SFSU biologist Andrew Zink in a news release. But Zink and his colleagues can’t track all of the infected bees alone. To help, they’ve enlisted citizen scientists who can log onto their website, zombeewatch.org, to report and keep updated on zombie bee-related news.